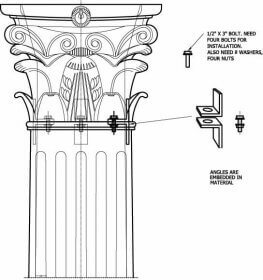 In order to keep this page from being a mile long, we have listed the specifications for decorative capitals that most frequently accompany our round column shafts. 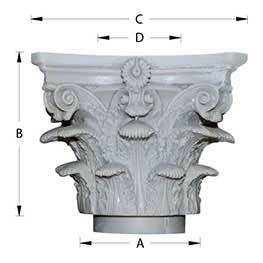 For additional sizes and styles for both round and square columns, we have 307 more decorative capitals to choose from. 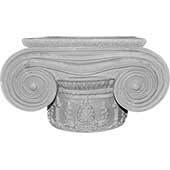 Royal Corinthian offers over 350 decorative capitals for both round and square columns: Roman Corinthian, Temple of the Winds, Scamozzi, Roman Ionic, Greek Angular Ionic, Greek Erechtheum, Greek Erechtheum with necking, Modern Composite, Empire, Empire with necking, and Roman Doric. 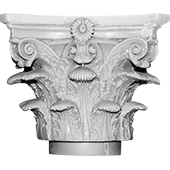 In addition, we have the ability to manufacture custom capitals: Our in-house mold making department allows for us to be priced competitively even on custom products. All of our capitals are available from the same material as the shaft, whether you choose our RoyalCast composite fiberglass (pictured above), RoyalStone synthetic stone, or RoyaLite “FRP” lightweight fiberglass. 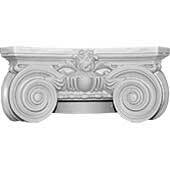 All of our capitals are available in all 3 composite materials. 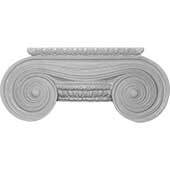 Decorative capitals add height to the column shaft unlike Tuscan and Doric caps which simply slide over the shaft (except for twist rope columns). 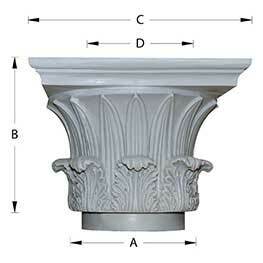 For proper installation of decorative capitals, the column shaft needs to be cut at the neck or astragal. Typically a cut at neck is done by the factory but can also be done in the field. 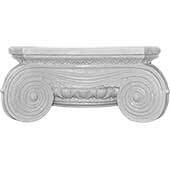 Since our decorative capitals sit on top of the astragal, they are load bearing; whereas, Tuscan and Doric, which slide over the uncut shaft, are purely decorative. In load bearing applications, the weight of the soffit/ceiling would bear down on the capital which in turn would bear down on the shaft that is sitting on top of the substrate/floor. 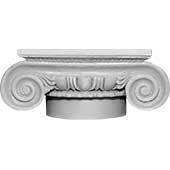 RoyaLite capitals are only load bearing when factory assembled but they will bear significantly less weight than our RoyalCast or RoyalStone capitals, which is why this product is best suited for column cover applications. 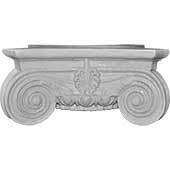 Most RoyalCast and RoyalStone capitals 6” to 16” are provided with an extended neck flange which slides into the shaft for ease of installation (extended neck flange can be added to or removed from any capital). Capitals 18” and up are embedded with L-brackets that align to the brackets installed into the column shaft (see diagrams below). 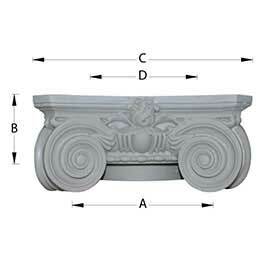 The L-brackets are only installed when capitals are purchased with column shafts. 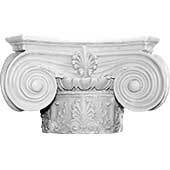 All of our decorative capitals can be provided without an extended neck or without L-brackets by request, which would allow for a wider hole opening inside the capital. 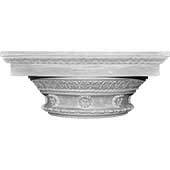 RoyaLite decorative capitals do not come with neither an extended neck nor L-brackets: They follow a different installation method altogether. 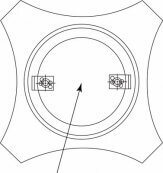 The “Hole Diameter (D)” for 18” to 36” in the chart below does not account for the space taken up by the L-brackets so if you are surrounding structural supports, please inquire as to the exact hole opening. The “Column Diameter” in the charts below corresponds to the bottom shaft diameter of round tapered columns. 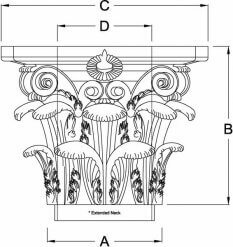 For non-tapered columns requiring decorative capitals, match the closest “Cap Diameter (A)” not “Column Diameter” to the shaft diameter of the non-tapered column. 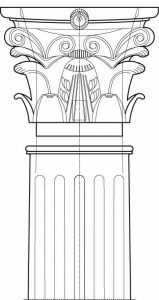 Keep in mind that the astragal of the non-tapered column flares out and will add to the overall diameter of the shaft where the decorative capital would rest. 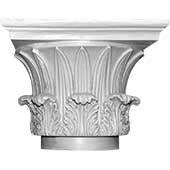 If in doubt, please consult our CAD drawings to determine which size decorative capital fits the non-tapered column in question or call or email and we will let you know. 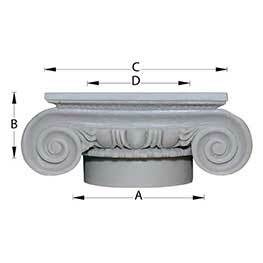 Chart “Column Diameter” is based on Round Tapered Columns. Decorative Capital weights are for RoyalCast and RoyalStone only and these weights can be decreased in half with the use of our lightweight filler, which results in the same thickness of material but at half the weight. 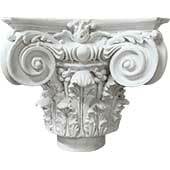 RoyaLite decorative capitals are significantly lighter than cast materials and can be used instead of the other materials where weight is of concern. Please inquire as to specific weights and hole openings of FRP capitals.